When Amitabh Bachchan Jumped on a Rickshaw for a shot! In most of his films so far, Amitabh Bachchan has always been seen riding some of the coolest vehicles. In Sholay, we saw him riding a quirky bike, in Don a Mustang and in Piku he was seen cycling. 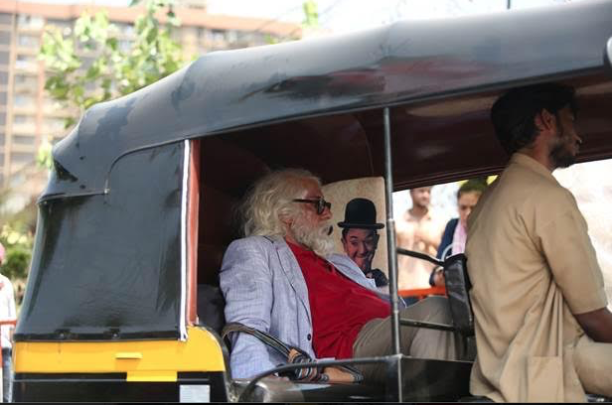 In the film 102 Not Out, the actor will be seen taking a rickshaw ride. For a scene in the film, the actor was required to take public transport from one location to another. And being the sport that he is, he immediately hopped into the rickshaw and did the shoot. Even though there was a crowd that had gathered to watch the actor shoot, the crew made sure that the shoot wasn’t disrupted and the fans who had come to see the megastar got a glimpse and were also not disappointed. 102 Not Out – is an ageless comedy that brings together Indian Cinema’s two biggest stalwarts – Amitabh Bachchan and Rishi Kapoor after 27 years, with the two legends playing father-son duo for the first time. 102 years young Dattatraya Vakharia (Amitabh Bachchan) lives life to the fullest and wants to break the record of oldest living man- that’s held by a 118 years old Chinese. Dattatraya wants to live a stress free life in order to become the oldest living man. However, there is only one hinderance- his 75 year old son Babulal (Rishi Kapoor) who has resigned himself to a life of old age stuck in drudgery. Dattatraya now must find means and ways to change Babulal’s sad and grumpy demeanour so that he doesn’t become a deterrent in breaking the record. Little do they realise that this roller coaster ride filled with comedy, emotion and commotion, will change them and their relationship forever. A Sony Pictures Releasing International Presentation and worldwide distribution – 102 Not Out, which also stars Rishi Kapoor, is Produced by SPE Films India, Treetop Entertainment and Umesh Shukla’s Benchmark Pictures.